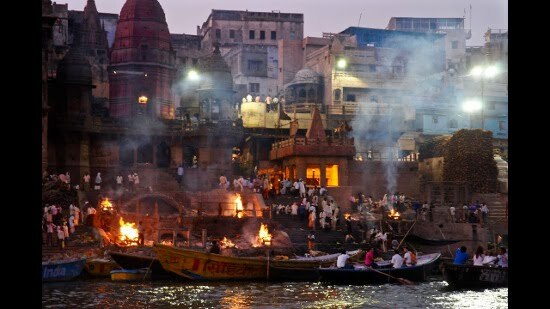 Varanasi is one of the oldest cities of the world and is considered as the religious capital of the country. A holy dip in the Ganges might be the holiest thing to do, but not the only main activity of the land. This city is always filled with millions of visitors, irrespective of the month and season. Do you know why? The city has numerous iconic and exclusive activities to enjoy. Here are the top things to perform in Varanasi. This Hindu city is famous for a long list of temples built at varying centuries. Explore the temples of the region to enjoy ritual activities, taste the delicacies served to deities, exclusive pilgrimage activities and much more. Do not stick with the iconic temples alone. Walk through the alleys and dark routes of the city to find many hidden temples. Ganges is considered a deity that was sent to the Earth for enriching the lives of the people. Ganges is said to be a beautiful power of forgiving. Thus, locals and pilgrims perform all kinds of rituals at the banks or in the river for the main purpose of salvation or forgiveness. Every evening, a group of priests come together and performs an exclusive series of rituals for the river. Thousands of tourists visit the Dashashwamedh Ghat to watch this ritual. Some even hire a boat and enjoy the ceremony from the water. Choose early morning or sunset time for enjoying boating in the river. You can get a panoramic view of the dulled and silent Varanasi. You will also spot many locals performing rituals and sadhus in trance state along the banks of the river. It is a very reviving activity of the city. Sarnath is an important destination for Buddhism. After enlightenment, Buddha reached Sarnath and preached his fellowmen. 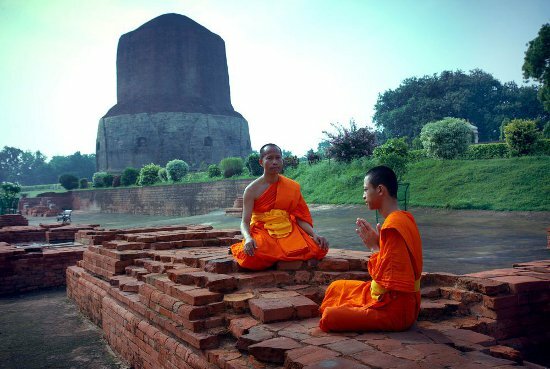 This is the first teaching of Buddha and thus, Sarnath has an important place in the Buddhism religion. Moreover, the region holds temples where Buddha spent rainy days, the place of his meditation and so on. Jains on the other hand, believe that it is the place of their religion. Thus, you can find many temples, stupas, pillars and ruins of the religions. The place where Buddha gave his first sermon is a deer park now. You can find many deer and numerous birds in this region. Visit early in the morning or right before sunset to spot many species here. This deer park has been in operation since 528 BC.This site is usually overlooked by many travel companies. Thus, check with them, whether the deer park is added to the itinerary. Every street of Varanasi is filled with shops. You can find many souvenirs, both cheap and exclusively costlier in this region. Top souvenirs of the land are Benaras Silks, ornate jewelry, bangles, deities, incense articles, pooja articles and much more. Try to haggle as much as possible. Do not spend money on copper vessels filled with Ganges water. The river is right in front of you and you can collect it in a bottle, if desired. Each Ghat has a specialty here. Kings of the olden days made many Ghats to allow people access the river with ease. One Ghat can cure leprosy; another one can provide salvation and so on. 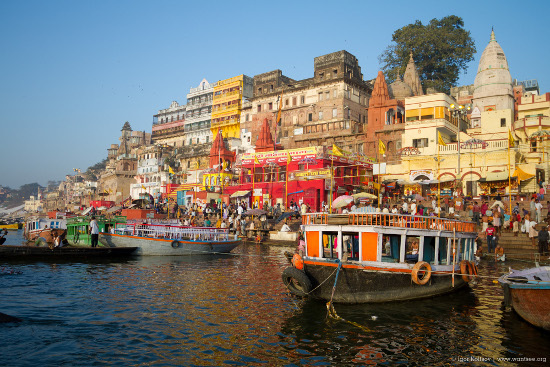 You can choose either to cover the Ghats on a boat or walk along the alleys to explore each Ghat, on foot. This might not be a great activity for all kinds of tourists. However, it is an integral part of Varanasi. Hindus consider this city as the place where God himself lived. Thus, thousands of people come of Varanasi just for spending their last days. On the other hands, people wish their bodies to be cremated in this city for eternal salvation. This is where Manikarnika Ghat comes to play. This is the Ghat where Hindus burn the dead bodies. Although a grim sight, tourists try to watch the ceremonies from a boat on the river. 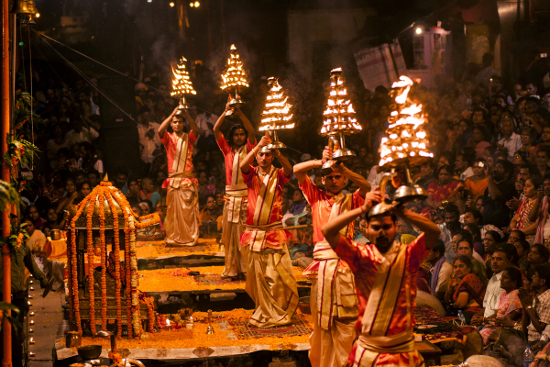 A religious trip to India is never complete without visiting Varanasi. Thus, craft your itinerary to cover Varanasi at least for a day or two. Varanasi Airport, known as the Lal Bahadur Shastri International Airport, is located at Babatpur, about 18 km northwest of Varanasi in Uttar Pradesh. On the other hand, international tourists like to travel to India via Delhi International Airport and choose any road or rail option, including the famous luxury trains such as Maharajas Express to Reach Varanasi. You can often find taxis and buses from many places and cities in the country.